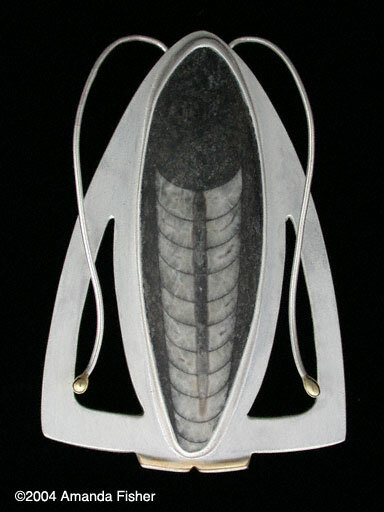 Several things inspired my Moth brooch: the insect jewelry of the Art Nouveau period; the orthoceras fossil itself; and my desire to use basic fabrication techniques in a sophisticated design as an example for my beginning jewelry students. Fused bezel on pierced sterling sheet with gold accents, and gold-tipped antennae. Sterling and fine silver, 18k yellow gold, orthoceras fossil. This is one in a series of Moth pieces, varying in details, size, and shape to complement the fossils as they vary.